The House and Senate appear to be moving through the appropriations process better and faster than any time in at least the last nine years. Congress should be commended for working on a bipartisan basis to follow the rules and deadlines laid out in the budget process. But this success is largely possible because they first gave themselves an extra $153 billion to distribute – financed by increasing deficits. This budget-busting bipartisanship is a sign of a broken budget process, not a functioning one. The budget process calls for the House and Senate to each pass, and then jointly agree on, 12 different appropriations bills before the end of the fiscal year (September 30th). Stand-alone, on-time passage of the full slate of appropriations bills has only happened one time in the past 25 years. Congress often passes “omnibus” bills that lump appropriations together, but even then, the on-time passage of all the bills has only happened four times since 1976. More regularly, “continuing resolutions” (CRs) temporarily continue funding based on the prior year’s levels. On occasion, the government has even shut down because the parties could not reach an agreement on funding. Encouragingly, this year’s appropriations process appears to be going smoothly. All 12 House and Senate appropriations subcommittees have reported bills. Many of the bills have passed with broad bipartisan support. Nine of these appropriations bills have passed the full Senate – some packaged together as “minibuses” – and six have passed the House (follow the process at Appropriations Watch). In general, observers are optimistic many appropriations bills will be law by the end of the fiscal year, or shortly after. This is good news! But it’s not the whole story. For one, neither chamber has voted on a budget this year. This would have forced lawmakers, at least on paper, to reconcile high spending levels with ambitous deficit reduction goals. While credit is due to the appropriators for their hard work in negotiating the details of the appropriations bills, it is unlikely they would have reached agreement without the bipartisan compromise to massively increase their pot of available spending. 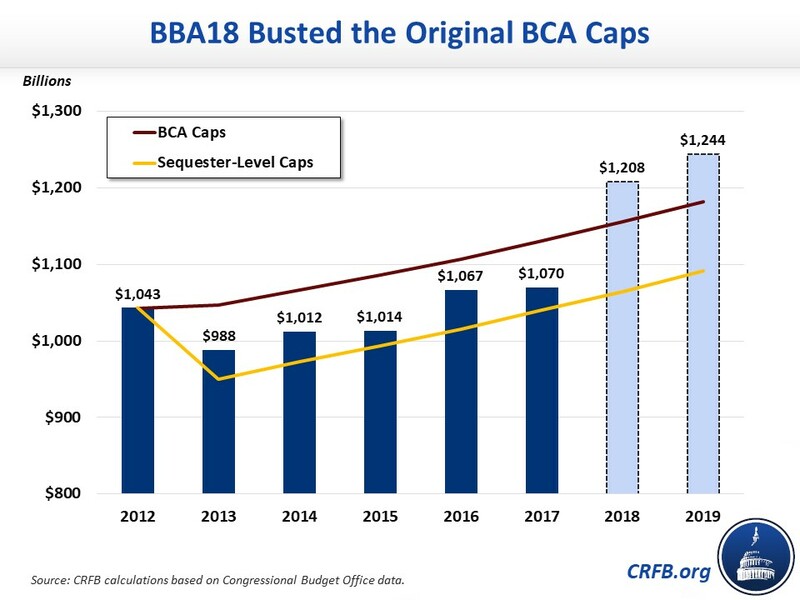 The Bipartisan Budget Act of 2018 (BBA 2018) increased discretionary spending caps by $153 billion in 2019 – from $1.091 trillion to $1.244 trillion. This increase is a full $62 billion above full "sequester repeal" – the original Budget Control Act caps which were agreed to on a strong bipartisan basis. The cap increase allowed appropriators to increase spending by 13 percent in 2018 and another 3 percent in 2019. When total appropriations are grown by one-sixth, it becomes much easier to have a smooth process. Rather than weighing trade-offs, appropriators only have to decide where to give money away. Even the worst-off bills last year saw a 5 to 6 percent spending increase; all appropriations bills were winners, with no bills facing reductions. Unfortunately, the losers will come later. While the Bipartisan Budget Act of 2018 made appropriations easier, it also added nearly $420 billion to the national debt when interest costs are included. If the two-year deal is extended, it will add $2.1 trillion to the debt. Combined with recent deficit-financed tax cuts, that will mean a massive new burden on future generations. Regrettably, fiscally dysfunctional bipartisanship is not new. Legislation passed by this Congress will add $2.4 trillion to debt by 2028. But last Congress lawmakers also added $1.2 trillion to the debt – largely through major bipartisan deals on Medicare physician payments and tax extenders. As a result, legislation since 2015 has cost enough to explain 55 percent of the nearly trillion-dollar deficit the country faces next year. It is easier for a broad swath of lawmakers to agree on taking resources from the next generation rather than fighting over how to generate needed resources from current taxpayers or spending beneficiaries. This type of bipartisanship allows policymakers to pat themselves on the back for a job well done today but imposes damaging consequences on tomorrow's citizens. Bipartisanship should be a means, not an end. We don’t need budget-busting bipartisanship. We need a budget process that works. Approving appropriations on time should be the norm, not the exception, and it shouldn’t take a $153 billion funding increase at the expense of future generations to make it happen. A better example of functional bipartisanship would be if the Joint Select Committee on Budget and Appropriations Process Reform (JSC) reports robust recommendations to improve the budget process this fall and lawmakers enact them. We have been working hard to support policymakers’ efforts to reform the budget process for years through our Better Budget Process Initiative. You can do your part by contacting your member of Congress and telling them to #fixthebudget. If you want to dig into the details, check out our recommendations to the JSC, recent testimony by Committee for a Responsible Federal Budget president Maya MacGuineas and Co-Chair Leon Panetta, and keep up with all of our budget process work here.